Charades are a great idea for a family fun night! Here are some song charades for a music-themed evening! There are many free printable song charades here to choose from – click here to print! There are some for popular children’s songs, some for current hits and some for guessing the musician. 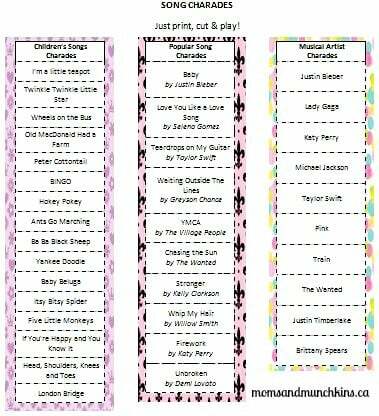 All of these song charades are kid-friendly so they are perfect for a family fun evening, a child’s music themed birthday party or just a fun way of spending a rainy day indoors. Setting up a charades game is easy. Simply print one (or all) of these free printable charades games, cut along the dotted lines, and drop all of the charades into a pail. Split your group into 2 teams. Team A chooses 1 person to be the actor for this round. The actor puts his hand in the bucket and (without looking), selects one charade. The actor then silently reads the charade. A timer starts and the actor has a specified amount of time to get his team to guess the charade. There is no talking or pointing in charades…you can only use your great acting skills. If Team A doesn’t guess before the timer rings, Team B gets one chance to guess the correct answer. Whichever team gets the right answer wins one point. If neither team gets the right answer, no point is awarded. It’s now Team B’s turn to choose an actor and pick a charade out of the pail. Test your acting & guessing skills with this fun & free printable children’s songs charades game. How many of these songs do you remember singing as a child? For these popular song charades, you can award bonus points for also naming the singer or group. Can you hum any of these tunes? It’s okay if you can’t – you just need to be able to act them out! Knowing a little bit about these artists & their life in the news may help you in this game! Do you have a favorite musical group? For more fun games, visit our free printable game page. To stay updated on the latest ideas for family fun plus freebies, follow us on Facebook, Twitter, Pinterest and Bloglovin’. Thanks this is exactly what I was looking for for our Backyard campout!!! Thanks again! Glad I could help! I hope you have a lot of fun with your backyard campout!